The Museum of Fine Arts in Boston had a puzzle to solve. Curators had always suspected that Bernardo Strozzi’s painting of Saint Sebastian, acquired in 1972, had at some earlier time been hacked down from its original size. The painting must have been incomplete because the saint was reaching heavenward and yet there was nothing in the composition above him. When the museum received a call that the missing top half of the painting had been located, they wanted to reunite the two pieces. But that meant that Andrew Haines, the museum’s conservator of framing, would have to chuck the old picture frame and create a whole new one to match the period of the 17th century painting. Haines and his staff constructed a special frame with a black divider to artfully disguise the gap between Sebastian and the angels. 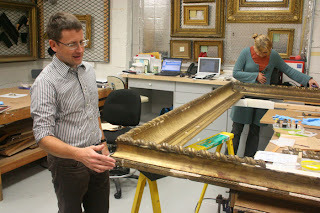 Haines is one of only about five full-time picture frame conservators in America. 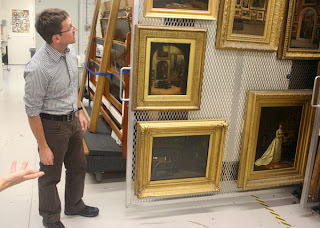 My wife Jeanette and I visited him yesterday morning in a workroom deep in the bowels of Boston’s beloved MFA. He and his assistants were painstakingly restoring a large frame from a Courbet (left), using dental molding material to cast missing chunks of ropelike relief elements. Repairing this one frame required the labor of three people working full time for three weeks. 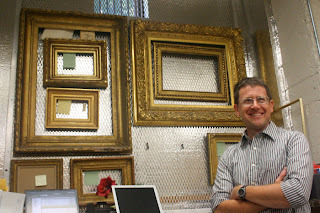 “A fun aspect of this job is that we get to see a painting in different frames,” he told us. Each period of art history had its own unique sensibility for framing. But all the fancy gold styles ultimately trace back to the decorative bling prized by the church in the middle ages. “European painting comes out of the Catholic church,” he said, and so do the frames. "Before the Renaissance, painters, carpenters, and gilders were all seen as craftsmen of equal stature, all working together as contractors to make altarpieces," he said. Haines rolled out the storage dividers in the painting collection to show us how the history of frames mirrored the history of art. Frames for American paintings, for example, often included decorative motifs from nature, like leaves and flowers. Here, Adeline is painstakingly using purified water to clean the gilded decoration that once graced a painting by Fitz Henry Lane (formerly known as Fitz Hugh Lane). 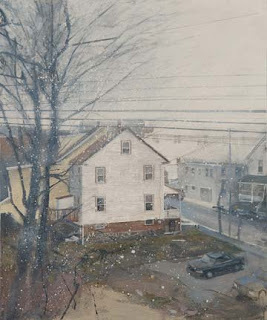 Jeanette and I first met Andrew Haines in his second life as a realist painter. We attended the opening of his one man show at the George Billis gallery on October 11. Mr. Haines gets up at six in the morning, sees his kids off to school, and then paints his own pictures for a couple hours before riding his bicycle to work at the museum. Take heart, you painters in spare hours! His own paintings are breathtaking in their Hopperesque simplicity and mood. His mastery of light, color, and composition clearly grows out of the close working knowledge of art that he receives every day at the MFA. Mr. Gurney, this trip of yours is shaping out to be quite the adventure. Thank you for taking the time out to make these wonderful posts. 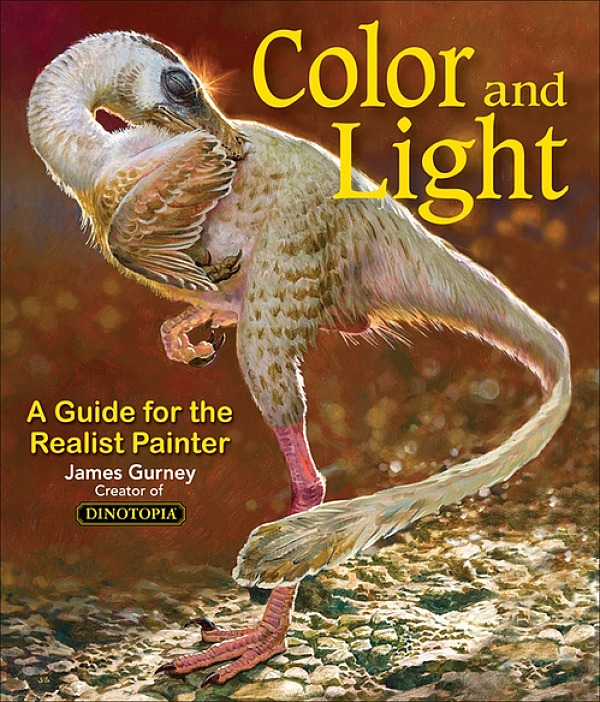 I constantly look forward to reading news from the Gurney Journey:) I look forward to hearing you speak at Art Center. Many thanks and careful out there on the road. 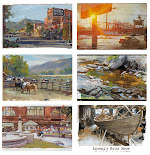 James, I have been enjoying watercolor and gouache painting in no small part due to your influence. Because watercolor blocks seem to come in non-standard sizes and custom framing can be expensive, I'm interested in doing a lot of that work myself. I would be very interested in a Gurney Journey blog post about matting and framing watercolor paintings. I'm not much of an expert on framing, so I might have to pass on that, but I'll keep an ear out for any interesting info about framing and matting.